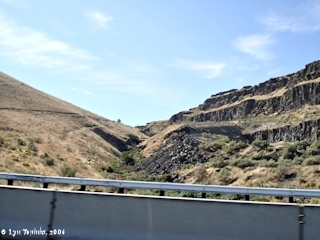 Click image to enlarge Philippi Canyon, Oregon, as seen from Interstate 84. Image taken October 2, 2006. 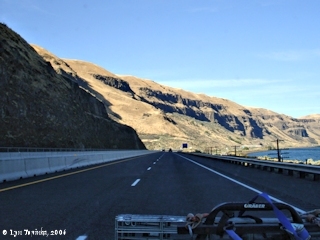 Philippi Canyon is located at on the Oregon side of the Columbia River at River Mile (RM) 227.5. 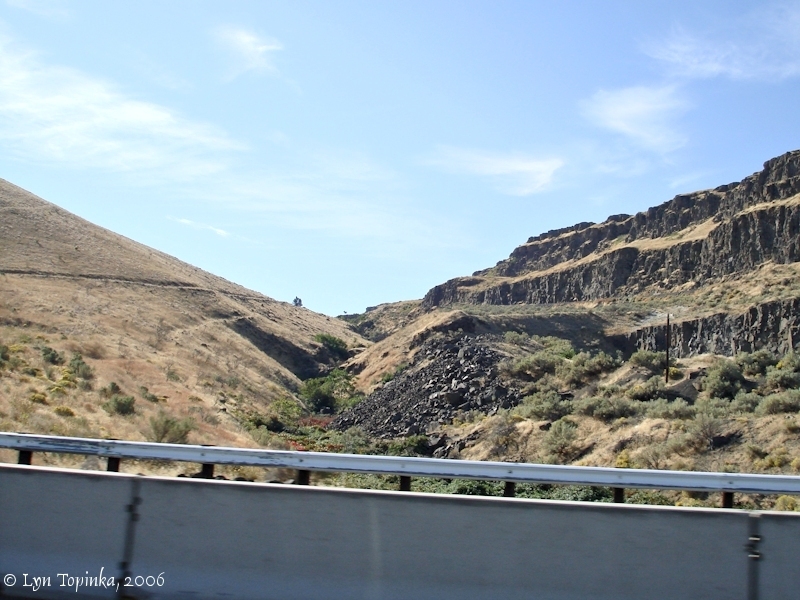 Upstream is Jones Canyon and Blalock Canyon, while across the Columbia on the Washington side is Rock Creek, the location of Lewis and Clark's campsite of April 23, 1806. Downstream from Philippi Canyon is the John Day River and the John Day Dam. "... Roy Philippi wrote the compiler in 1970 that his father, Albert, homesteaded this land in the 1880s and that four generations of the family have lived on the ranch. In 1970, the USCE developed Albert Philippi Park at slack water on John Day River on land that was part of the Philippi Ranch. ..."
The Bureau of Land Management's General Land Office (GLO) Records shows Abert Philippi being granted title to 160 acres of T3N R18E Section 20 on September 9, 1895 (Homestead Entry Original of 1862), and Albert Philippi being granted title to 160 acres of T3N R18E Section 20 on June 27, 1902 (Timber Culture of 1873). The Township/Range of 3N 18E plots on the high land between the John Day River and Philippi Canyon. An early name for Philippi Canyon was "Quinton Canyon". Quinton was a railroad station located downstream of Philippi Canyon. Click image to enlarge Interstate 84 heading west, approaching Philippi Canyon. The Columbia River can be see on the right. Image taken October 2, 2006.